Interest in public banks has spiked over the years in response to the public’s increasing discontent with the financial industry. The 2008 financial crisis, the Ferguson uprising, growing divestment campaigns at universities, and the fraudulent accounts scandal at Wells Fargo has intensified calls for banking alternatives that curb the power of Wall Street and reinvest money into communities. As the movement grows, Oakland is now joining a long list of cities pushing for public banks. 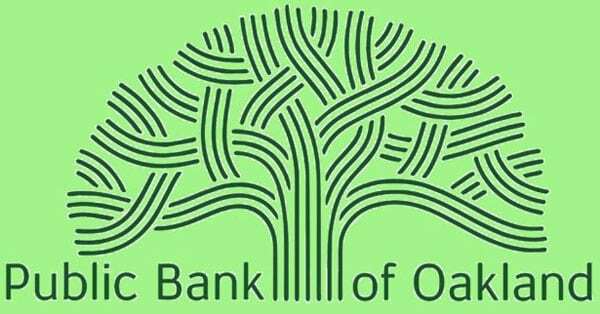 The city intends to create a regional public bank with ownership shared among the three cities of Oakland, Richmond, and Berkeley, as well as Alameda County. While there are no city-owned public banks in existence in the United States, that has not proved to be an obstacle to the city’s initiative, which is modeled after the Bank of North Dakota, the only public bank in the country. Founded nearly a century ago, the bank’s mission is “to deliver quality, sound financial services that promote agriculture, commerce and industry.” As reported by NPQ Senior Editor Steve Dubb earlier this year, the bank “earns a profit for the state, earning $136 million last year, its thirteenth consecutive year of record profits.” Each year, the bank contributes an estimated $30–50 million to the state’s general fund which provides funding for low-interest student loans, disaster relief programs for ranchers, education, and infrastructure projects. Proponents of Oakland’s city-run public bank are hoping to achieve similar results. Ideally, the chief objective of a public bank would be to serve the public, unlike private banks, which primarily focus on generating shareholder profit. With the public’s interest as its foremost objective, a public bank in Oakland could finance projects of greatest interest to residents, including alternative energy infrastructure and affordable housing. Additionally, public banking could serve as a cost-saving measure for the city. Transferring city deposits to a public bank would save millions in dollars typically paid to commercial banks for debt service and annual and transactional fees. So far, the establishment of a public bank has received overwhelming support from Oakland City Council. On September 11th, after reviewing the feasibility study brought forth by the Friends of the Public Bank of Oakland, the Finance and Management Committee unanimously voted to bring the issue to full council for discussion. However, despite positive support, establishing a public bank still faces a number of hurdles, particularly surrounding cannabis legalization and high startup costs. While deposits from cannabis would prove profitable in a public bank setting (the state expects to collect $600 million in cannabis taxes in 2018), conflicting state and federal laws would make the deposit of funds from the cannabis industry a money laundering crime. To side-step this issue, experts are suggesting the creation of a two-bank system: “one focused on depository services and the other a state-chartered ‘infrastructure bank’ that would serve the cannabis industry exclusively.” The legislative framework has already been set to make this a reality. In late May, the California State Senate passed a bill permitting state-chartered banks to apply for special cannabis banking licensing to serve an industry that still largely operates on a cash-only basis. In addition to the issue of cannabis legality, financing a public bank without draining other areas of the city’s budget is of major concern. Paul Pryde, a member of Friends of the Public Bank of Oakland and former chief consultant to the US International Trade Administration, recommends securing financing from public and nonprofit agencies with similar interests such as the California Air Resources Board which receives approximately $1.5 billion in revenue from cap-and-trade auctions or the California Housing Finance Fund which may value additional sources of low-cost housing loans in Oakland. Additionally, the feasibility report suggests taking advantage of the growing interest in impact investment.